The Treat Ball toy is a 4.5" diameter high impact plastic treat ball. It is safe, non-toxic and easy to clean. Dogs LOVE this ball!!!! There is an adjustable opening to allow the dispensing of different size treats. 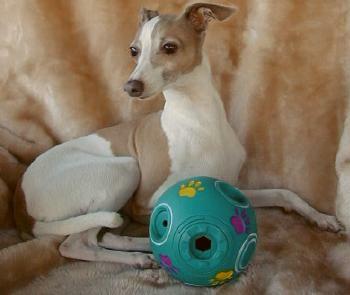 The gorgeous and disgraceful Iggy, Gracie Longhouse, is BANANAS over this ball. When filled with kibble she will drive everyone within hearing range BANANAS for 30 minutes straight. For those of you who suffered through the Great Duck Caper last year...this ball is worse....yep..you heard that right...WORSE!!! While dogs LOVE this bowser ball...humans go WHACKO! 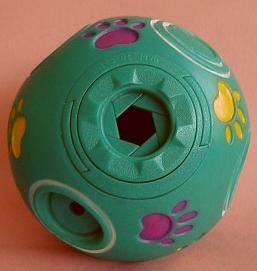 This ball is manufactured by Vo-Toys and is called a "Chuckle Treat Ball". It is without question Gracie's favorite all-time toy. Price is $15 for one or $25 for two. Please click on first PayPal button to order one Treat Ball . Click on second PayPal button to order additional Treat Balls.